Paid for full subscription, app says my trial has ended, sends me to subscription page which says I have an unlimited subscription. Cancel and resubscribe gives error. You went from a decent news app 4-5 years ago to complete garbage. I enjoy reading the news but the website and app are of poor visual quality. LA is rich with visual artists and I suggest some need to be in the employ of the Times for better user interface. Oh! LA Times has become a website throwing clickbait teasers on Facebook. So long. I love the LA Times. Too bad I can’t read it through the system. It continually locks me out. Even though my Subscription is paid and up-to-date. The system sends me to a site where it shows that I have paid, but then it will not let me access the newspaper and read it. I can only read the headlines. So frustrating. Enjoy keeping up on California and national news. Great in-depth reporting on interesting topics. Also enjoy articles on book, movies, music and art scene. The Times is so biased it’s stories lack all credibility. The selection of topics to report is ridiculously slanted. Then the coverage of stories selected has no balance. Most news columns are thinly veiled opinion pieces. If you are looking for news, paying for the Times is a waste of money. Just go to any Democratic website and you can read a the same information without the dishonest presentation of the information as news. This app charges me 5.00$ a month and I can not even access it! I read an article in full, and as I keep scrolling down, it does not move smoothly but closes. Same stories repeated way too many times in online app. Seriously why does the app kick out to a browser for breaking news, why not stay in the app where I’m already logged in? The app still does not allow resizing the text on screen with pinch and stretch. This is an app solely for the purpose of reading the news, and in several years it still does not have text resizing. Totally incompetent organization. I’m from the days of morning and afternoon paper. I like the national and political reporting, though as of late I have noticed a change in tone since the takeover. Please keep as is. Either report the truth or stop saying you do. You report things with adjectives that imply or flat out mislead. If you are truly trying to tell the truth ask your self this. How many of your reporters are Trump supporters. None including you ! RIGHT? Okay I could handle 60D’s vs 40R’s even 70/30. But you and most papers are 99% D’s. With that you can’t be unbiased. Also any new wood gets savaged by the D’s. This is a disaster for America, and for the value of your paper. Give both sides of the story. Right now you don’t. its great except I wish they would make it so the article on the electronic newspaper only opens if you touch a certain spot, not anywhere in the article. Lot of times I like to read the paper in the same form as the physical paper and open the article only if I want. It’s irritating that it too quickly opens by touching anywhere on the article by accident when u don’t want it too. They do an excellent job of reporting news without all the speculation and hype. Seems to be a very dedicated and trustworthy organization. Worst news app ever. I have the paid version and it shows old news constantly. The same stories stay on the app for days, and they stay at the top when you open it. Even after I’ve clicked and read the story it stays at the top of the app for days. The app is also loaded with huge ads. It’s impossible to scroll over them without opening them. There also doesn’t seem to be an easy way to search. And the tabs that sort the news show the same stories over and over. Select local and see a story. Select California and you will see the same top story. Select nation and you guessed it, same story. This app is terrible and makes me miss reading the old paper version. There are much better news apps such as the New York Times. Compared to NY Times app, the LA Times app is very sloppy. Articles reappear after scrolling. It needs some serious revision. If the people who are tasked with making (coding) this app would take a look at the New York Times app, they would see how far they to go. Maybe they can get Patrick to support their efforts. I hope and pray. This is my favorite local news app, from one of the most reliable and well-written sources of news. Los Angeles Times has made a remarkable transition to a digital media platform, in a short amount of time, recognizing the need and opportunity in this market for a comprehensive news solution. Thank you for including an unlimited digital subscription with Sunday newspaper service and keep up the great work. The HUGE pictures and mix of large and small headlines make it difficult to skim and find articles on iPad. Stories are frequently repeated in the top news. 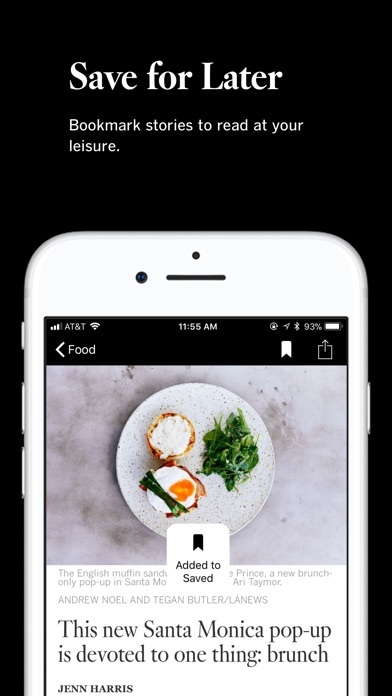 Previous format was more user friendly with thumbnail photos and consistent format which only showed large photos after selecting associated articles in the previous app. Growing up in Pomona, the Los Angeles Times was on our breakfast table every morning. The paper reflected a ‘centrist’ political viewpoint. Today, this paper is so left-leaning in it’s bias, for me it has ceased to be a reliable source for news. I still enjoy the great local stories and quality writing on Southern California topics. I love the LA Times. My parents have been subscribers since the ‘60’s and me since the ‘90’s. However, I love the reverse black screen and large print that the Washington Post’s App provides. I love The NY Times, LA Times and WP but WP is the superior app by far. Please provide the black background feature, and more spaced out headlines, for easier reading and navigating. Everything else is great! I’m excited s out the new ownership and management and look forward to following your progress! I still can’t figure out why some articles can be saved and some can’t and have yet to receive an explanation. Unbelievable. 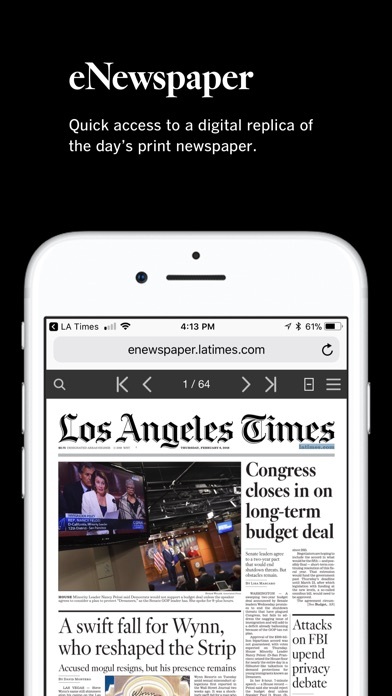 Buyer Beware, the Los Angeles Times app does NOT provide access to the entirety of the daily ‘paper.’ To read or access the full version of the LATimes you must download the pdf of the print version or login on your desktop. Even with a paid subscription, the only offering here is strictly news lite. Couldn’t get it to work for five days. Cancelled after just 5 days. Is too important a town not to interested in its local news. The world news from the left coast gives me a different feel from what i lack from my own perspective. I downloaded the app on a WiFi connection. I pulled it up and every page says it cannot load without an active connection. I keep pressing Retry and nothing happens. I’m on my home WiFi, full reception. I also have 4G as a backup. This app is 100% useless to me, I can’t see a thing. The reporting is fairly thorough, and usually well-written, but LAT keeps circulating the same stories for at least a week. But all the major papers do this now. I am a paid subscriber but can't use the app. I emailed support and got a response from a mailbox that is not accepting emails. Terrible. Poor business model to ignore many, many people who have older iPads which still function well. The LATimes app should be functional on legacy iPads with legacy iOS in order to reach as many people as possible. It seems they think the only audience would be those with the latest and greatest from Apple. Maybe that is partially why the paper is in trouble. Bad business planning. I have a subscription through iTunes for unlimited digital access. But when I log in to the app, it recognizes my login but tells me I need a subscription, which I already have. I’ve tried restoring the subscription with no luck. I’ve deleted and reloaded the app, with no luck. I’m paying a subscription that the app won’t allow me to use. I am hoping the app people can help me sort this out. I’ve already tried Apple support and they say it is an app problem. I love the LA Times! Keep up the great work! I have been unable to access my premium account for two months, and after repeated emails (which would take days for them to respond) and a phone call to technical support they are unable to provide any solution that won’t give me an error message when I try to restore or access my account. Extremely disappointed. Can’t read many articles. It keeps asking for free 30 day trial, only option is to choose it, then a box comes up saying I’m already subscribed, which I know, I’ve paid every mont for a very long time, then it gives me a box that says error. Then only option is to not read articles just get screen asking to subscribe. Why have I been paying $7.99 a month to read the few articles and get that same 30 day free trial screen and then be blocked. Why can it only see I’m subscribed when I press Start Trial, why can’t I read all the articles. So frustrating. I want to support journalism, but I want to read all the articles I’m interested in too. I can send you screenshots to show you what I’m getting, I’d appreciate help on getting this resolved. And yes I’m signed in to the app, so it should have been able to know I have been paying the monthly subscription. App difficult to navigate for subscription. Full of bugs. Impossible to use. Although I pay for unlimited digital access, I regularly get error messages telling me that I’ve reached my monthly limit of free articles. The only solution seems to be logging on and off several times until the system resets itself. The help desk people send me the same boilerplate message each time I contact them, which indicates that others are having the same problem. It’d be better for them to fix the problem, rather than telling customers to solve it. I’m a long-time reader of the L A Times and recently dropped my Kindle subscription to subscribe to the digital paper that directly supports the new local ownership. I hope the minor glitches in technical quality get resolved and coverage expands to include more in depth coverage of national and international issues. The photography is definitely better. Keep up the direction you’re heading! Bought internet version on a special. Almost unusable. The LA Times has dumbed down its app to the point where it is an insult to its readership. Do you want to scan through the headlines for an article? Good luck with that. 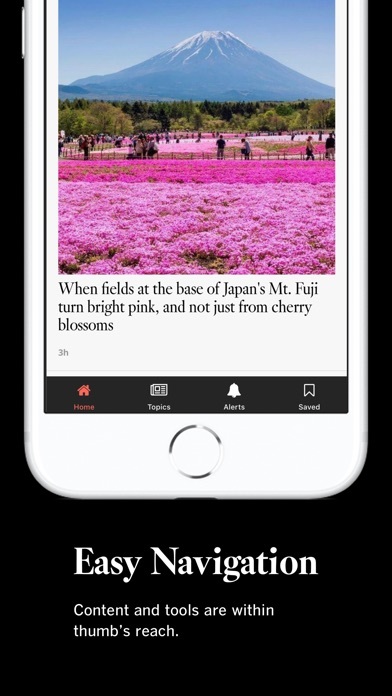 This app is all about giant color pictures, which you have to scroll down down down down to find an article you may be interested in reading. If you go to the topics page, it is somewhat possible to flip through the paper and see what might be of interest. However when you get to an article, it is scrunched into a ridiculously skinny right hand column, and there is no way to get a full-screen view. My only conclusion is that the tTmes considers its readers to be morons who prefer to look at gigantic color photographs Instead of headlines, news and analysis. Thank God I also subscribe to the New York Times and Washington Post, who have set up their apps to serve the needs of people who actually read the newspapers. I can only hope that this is a sad, pathetic relic of the TRONC mismanagement of this once excellent newspaper, and that the new publisher will swiftly relegate this awful embarrassment of an app to the garbage heap where it belongs. Previous version was klunky, but you could easily see a number of story headlines from which to choose. This version pushes screen-filling photos at you, assuming I suppose that I can’t read or don’t care to exercise my brain beyond staring at images. Browsing experience now is mostly intense scrolling to hunt down stories of interest. I recently subscribed to digital delivery of the paper and when I try to login, I am told my password is not valid. Other than that, the look is nice. We must read the news. We must know what is happening with our government and the policies that are being affected and implemented by the current administration - regardless of one’s political affiliation. We must learn about what’s happening in our community. The LA Times is a well-respected newspaper and online platform that should be a must-read. It must be championed so we can nourish our minds so that wisdom based on facts, human decency and genuine well-rounded awareness can prevail. Bravo to the reporters there - in all sections of the paper. You are important and matter more than ever. Thank you for all you do. I would give this app zero stars if I could. Over six weeks ago I purchased a digital subscription to the LA Times. I immediately had problems and was told by their tech support that “it takes two days” for registration to be completed (huh??? After full payment, in this day and age???) so was given a temporary LA Times issued access code. Once it expired, I still could not activate my fully paid account on this app or the website. Cue more calls to Tech support and I still cannot log in to the app. The last tech, three days ago, simply told me that I would receive an email in 24 hours to address the problem-he didn’t even try to assist on the call. Yup, you guessed it, no email, no functionality. The LA Times was recently purchased and needs to immediately address its digital and app functionality. I chose to buy its services-what a mistake. The version that looks like regular paper format no longer loads on I pad or I phone. They keep taking their monthly subscription BUT accessing the news is a continuous problem! Have lived off the LA Times for years, but it has become a local paper and sadly no longer a world class newspaper. Please, LA Times ..... become important again. Repeating headlines, wrong stories when you click on one, unable to change settings. Absolutely lame! Harder to navigate, hard to read. App is out if sync with the print edition and doesn't include all the important news. Works fine, but. . . It would be nice if there were a section for columnists, or if the search function would take us to a columnist’s page when we type their name in. Don’t bother to try to search for a story with the app’s search option. Even using the author’s name (usually the best way), you’ll be lucky to find the story you’re looking for. Otherwise the app is good for local news, except it’s slow to get breaking stories online. I have read The Los Angeles Times since 1974, what a great newspaper it is! It keeps us informed about our local & global insights. I have become this well informed individual due The Times publishing’s.. To Love LA is to Love The LA Times.. Your in-depth coverage keeps me reading both print and electronic issues. Please increase those pieces and never loose Hiltzik! Hate the new app. The same stories are displayed repeatedly while you scroll down. You see the same 8-10 stories over and over. Editorial budget cut so bad you only have 10 stories worth displaying? The app looks good (easy on the eyes, not bogged down with a ton of multimedia and ads) but the search function is horrible! Most results are from 2 to 4 years old. I regularly see a headline on Bing or Google news from the LA Times and go to this app to read the article — but have a devil of a time finding the it. This even happens when I search for the complete article title?? Maybe they are just trying to simulate how we all once flipping through a newspaper to find something of interest to read. Fix the search and I’ll give it two more stars. There is a bug in this app for both iPhone and iPad that blocks special characters from being accepted in your password, rendering the app useless for paid subscribers like me. Will cancel my subscription soon if this keeps going on unaddressed. The app is broken and won’t even let me sign-in with my active subscription account. This app is as broken / defective as all the prior versions of the app. Avoid! The newsroom still has some veterans who carry on great work. But for the most part the reporting is thin. The new owner can make vast improvements if he expands the newsroom and replaces not-ready-for-prime time reporters with journalists who know how to dig. The website is balky and needs an overhaul to make it as seamless as those by the nation’s leading news organizations. Great reporting and professional journalism. Easy to use application and many options to optimize usage. Don’t like viewing the ads when already paying for a subscription. My second time trying the online subscription. Same result. Cannot log in. The login process is broken. And, of course, impossible to get immediate help from a real person. This blows. 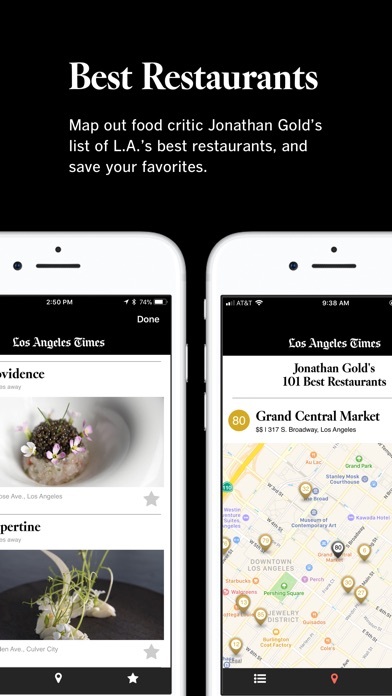 I was very disappointed with the LA Times up in mid 2017 timeframe but as of summer 2018, I have to say that the app has drastically improved and makes a lot more sense to me. Also the articles that are highlighted when you first go into the app makes sense rather than just what is chronologically most recent which seem to be the way it worked last year. Good job fixing the issues. What the heck? You people are clueless! Go back to any of the older styles from the last 5 years. I subscribe to the LATimes print newspaper, which is essential reading for anyone living in California. Nonetheless, I enjoy the mobile version on my ipad for a well chosen selection of interesting, timely, shorter pieces. It’s an attractive app. I like our superior Colorado’s supreme newspapers better. I was born, raised, educated and earned my living in LA until moving to La Quinta, CA beyond Palm Springs in late 2015. One of the things I missed most was keeping abreast of the local LA news, as well as receiving high quality journalism about national snd world events. Reading the LA Times, both in it's digital and printed editions, has met that need and even serves as a security blanket of sorts. I have high hopes that under new leadership the LA Times will be restored to its World-class ranking and eliminated or shaved sections with their fine contributors reinstated. I have an unlimited digital access subsection, but I keep getting an error message when I try to access subscription-only content. Nothing is better than waking up in the morning to a cup of coffee and the LA Times. I loved the printed version of the paper as that is what I grew up reading, but I now love the digital version I have on my Kindle. Not missing a thing. Been reading it for over two decades - news is unbiased, real and personal. One of the better Sports sections available, though seemingly favoring USC when it comes to football! I use apps to read at least four papers daily, and definitely feel that the LAT app is the best! Never a problem scrolling through, always able to easily, quickly get the news you want. This app is truly the best designed and most reliably functional. I’m delighted! The app is great to read articles, only if you connect from their email saying the daily paper is released. You cannot launch the app and read. My subscription does not connect. It is a pain and limits the reading of the paper. I had to log in and get charged for a new membership because it didn’t recognize me. Can’t log in over and over and over. Iam going to cancel subscription! Ads in a paid app! Update: So I tried the app again after 2 years, but thanks to the ever-present ads and one of the worst and most arrogant privacy polices I’ve ever read, I’m really done. Update: Now - or maybe for awhile; I rarely use it anymore - the app launches your browser whether you tap an ad or not, and I most definitely did not. Great way to draw in subscribers. Not! I'm done with LAT. Not cool. I detest advertising and would pay a fee rather than use an ad-supported free version. So this was an unwelcome surprise. I'd even pay a reasonable subscription rate rather than have to look at ads. Bad move, LAT. Can sign in fine from my Mac and on the normal site from my phone ... but this app doesn’t let me sign in. Won’t recognize my password. Completely useless. I have never succeeded I. Finding the article I was looking for using the search tool! Today there was an excellent interview by Randy Lewis with Robert Hilburn about Paul Simon. I searched using each of those names—the article published in TODAY’s PAPER did not come up in the search! This is a poorly designed app. Sad for the once-relevant LA Times. Just really poorly done. I appreciate that it's intended to bring the mobile version more in line with the desktop digital version, but the prior interface was suvh a superior mobile experience compared to now. What an improvement!! Still a work in progress, still buggy, but potentially on its way to being the app a major metropolitan city deserves and needs from its newspaper. —I have an Unlimited Digital Access yet often the app tries to sell me unlimited digital access and denies access to articles. TOTAL FAIL. —No option to custom order sections, an egregious oversight —When scrolling through a section articles are repeated, over and over, hey LATimes if you're out of content let the user reach the end of the page instead of shoving the same article on us repeatedly as though we’re idiots and wouldn't notice. —Navigation is clumsy. —Not all articles had pub dates which is totally unacceptable. —Photos are tough to access with buggy slide shows often freezing and making the app quit, don't even bother trying to access video. Emulating NY Times app could go a long way to improving the LA Times app. Looking forward to updates! Original review: It's staggering that paid subscribers are subjected to this miserable excuse for an app. Clearly the LATimes owner hates Los Angeles, hates Journalism, hates writers and hates even their own paid subscribers. It's tragic to see what was once a great newspaper degenerate into this app. On iPhone 5S with fresh system software update: can’t logon, can’t search, can’t find my topics of interest. LITERALLY. Data I enter does not go back to the server, while I have an internet connection that works. The digital newspaper is super handy for people new to LosAngeles. I don’t go to every event, I know what I miss. New update: 98% pictures-2% news. The new app is unusable. You have to scroll through page after page of huge pictures searching for articles you want to read. I gave up after about 10 screens of pictures and not finding anything I wanted read. I'm not using this thing again. I'll use the browser version that still shows you multiple articles on the screen at the same time. Love the app. Wish it wasn’t presented in white on black. Triggers migraines. Read an article on it somewhere but can’t find it. Start investing in your iOS mobile application. I cannot click on an article - the app just doesn’t respond yet everything else works. Tested 5 x including force closing the app. iPhone X on VZ network. Bring back your real management. Your leadership team seems to be underinvesting in app QA before your releases. Get it together. I’m a paying customer. Embarrassing!! Difficult to find articles in “today’s” newspaper on the app. OC edition of Weekend isn't available on the app. Really??!!! The new format is confusing and repetitive. I’m giving serious consideration to canceling. Another bad “update” to an app that was functioning just fine. Now there’s much less to read and more repetition and old news than anything else. Take us back!! But still get shut out of site. LA times - I am disappointed with you!!! The new website is terrible. Articles are repeated. Bring back the former one, much easier to enjoy. No place to put vacation stop. I see articles in the paper that I want to read in the app and it sometimes takes a Herculean effort to find and get to them on the app (the website is basically the same in this regard). Please make it easier to find articles by organizing the information better and making navigation and search better. The refresh stinks. Repetition of stories. I have been reading the LAT since 1979. This feels gimmicky. Kinda like the WWW 1999. Sad. The latest redesign is pleasing to the eye and easy to navigate. Good journalism, good layout. I do wish I had the ability to customize the experience. The prior version allowed you to manually choose the order in which sections appeared. I’d like to see that make a comeback. The updated version is horrible. It is not user friendly. The old version made sense, was easy to navigate and much easier to use. I want the old version back!!! I used to use the app constantly, even with its flaws, but as soon as they started the new format I find I don’t use it anymore and I just download the newspaper version. With big pictures it is harder to navigate to find what the important stories are. I like headlines so that can see at a glance the important news and stories and and pick from among them. The sections are on a small band at the top awkwardly listed horizontally, I don’t know if I can change the order to suit my usual preferences. The news app on my phone taking articles from multiple sources is similar in its use of pics, but much easier to use listing the four or five latest or most popular articles, but the proof is in my usage. When the change first occurred my brother railed about the new format, but I’d been such a long time user that I thought he was overreacting, but months later I just don’t use it. Send us a note if you change it. If there is a fee for it I will drop it. The news is not written by bots, it’s the work of caring professionals. LA is blessed with a great news room. Support it! Worst version ever! Previous version had what all other reader apps have — adjustments for preferred type size. Now there is no way to adjust any reader preferences. DELETED. I love LA enough to subscribe to the Times. Today through another contractor , they changed the layout. I’m always for “ new change “ but this new layout is not what I wanted. I’m old school and like to feel as though I’m actually reading a paper . Until old layout is brought back then I’ll re-subscribe again . Goodbye old friend. Please revert back to the old format. This new Washington Post style format stinks. About the dullest major news app available. And the redesign hardly improve things. It’s very unattractive and why so many font sizes and shapes? The app is not worthy of the LA Times. Hopefully the new owner will have some cents and will completely revamp this thing. I like the online version for tablet reading, and the app for my phone. It was better before you decided to improve it. Now it just repeats the same list of stories over and again. It wasn’t broken. Why did you decide to fix it? I love getting the paper on Sunday, which is a pretty good deal, and got the app just for the heck of it. But now that’s what I use primarily, and I use it daily. I live in the greater LA times, so I like this being my primary newspaper. I like online news too, but this has lots of local stuff that I wouldn’t be reading about otherwise. New format change months ago is awful. It was fine now it’s horrible. Why change something that didn’t changing? I’m not sure if could be worse. This is a sad attempt at a news app. It will repeat the same news multiple times in the same section, often one under the other. I go to their e-newspaper which mimics the paper version. News may not be as current, but at least it’s not broken. The older version of the app had more summary content to gage the content of a story. And yes, smaller pictures. Many time here all you get is a big picture and a short comment. The LA Times should be applauded for astute coverage of global & local news. Thanks for helping me to keep up with Hollywood—where my niece pursues her filmmaking career. I am a subscriber and the app doesn’t allow me to read the news. Can’t you double the number of free read stories each month? I had to cancel my hard copy subscription because of poor or no service. I really do not enjoy reading on the iPad. As I scroll down it’s the same stories over and over. It’s terrible. To the new owner: standard American corporate practice, greed before ethics, gutted our local paper. Please invest and change that.... This app favors headlines over substance. We know you can do better. Good luck. I get the weekend papers. Nice to have the app with unlimited stories Would have liked to have had better access to photos when of worked. Was working fine until recent iOS update. All other apps have offered updates since then. No new LA Times updates in over a month. Hasn’t been working. Been too busy to contact the LA Times. Billing practices are crazy; finally reached my limit and canceled. LA Times... what are you thinking? Actually, it's several steps back. (Not that the old version was any great prize.) The articles have some pretty pictures. Too bad significant portions of the the print edition are always missing and more don't download to the app for offline reading. Also, some of those pretty pictures show up in the app for weeks at a time because the Times can't be bothered to organize ALL the latest content in a way you can see it conveniently. (Instead, for example, a pretty picture of Kawhi Leonard continues its multiweek run in the sports section, while the same Dodgers story may run three or four times.) Finally, tronc, could you please stop trying to ram your 100 Best Restaurants feature down our throats? We really don't need it popping up over and over and over and over in the app. Perhaps y'all should think about how people use your app rather than engaging in a self-congratulatory exercise in pretty pictures and favored features. Silly title, isn’t it? I figured people might read this: As a reader of news on devices for only a year and as a homesick native, I appreciate the ready availability of access to the Los Angeles Times. Who else but someone like me, living out of state and missing my home town paper, would turn to a wonderful app like this? And not just for breaking news in politics national and local but also traffic alerts! I hadn’t known there were Metro Line tracks along the 210. I felt something akin to being there, although there may have been the automatic sympathy (Oh no!) one feels as a heretofore daily commuter in the Greater Los Angeles Area. I remember when the 210 had been proposed and approved, and was controversial due to expected segregation between “whites and blacks” in Pasadena. I read all about it in the LA Times. No one anticipated black flight, much less light rail connection. I read about those in the LA Times, too, all of controversial. I guess this is all to to say that I Heart the LA Times and its app! Thanks for reading! Love the LA Times. We appreciate their professional level of journalism from all their regular columnists and the paper in general. Life would not be as interesting without the excellent writing from the LA Times. Go LA Times! Hate the new format. Want the “newspaper look” format back. the new version has a bad “information to screen real estate” ratio — only one story “teaser” (?) per screen. The SD UT has a very user friendly App. The LAT does not. Same owner. Come on ! About the dullest major news app available. And the redesign hardly improve things. It’s very unattractive and why so many font sizes and shapes? I've been subscribing to the digital app for years, for a reasonable monthly cost. In recent months, I have been occasionally asked to reconfirm that am a subscriber by entering my iTunes password. A tolerable annoyance. Now with the redesigned app, every time I click on a story, a message pops up saying I have reached the number of free articles snd must subscribe, even though I already subscribe! To get past the erroneous paywall, I have to delete the app, and re-open it via the App Store and then I can read the selected story. Nguoi giau nhất Dong Nam A la ai ? Co phai ong phạm nhat Vuong ko ? The new version is a lot easier to scan, as top stories get more promotion, and have links to related pieces. And more sections available than before. The writing and content are as good as ever. App is really easy to use. The recent marked improvement in visual appearance and ease of navigation for the web site seems to be matched by increased funding for hard-nosed investigative journalism. The enhanced focus on efforts in the state to combat global warming, homelessness, human trafficking, and possible criminal misconduct in our nation’s highest office are commendable. The paper seems to be struggling back to what seems to me has always been its prime mandate - highlight local California efforts that impact global challenges to our survival. Enjoy the ease of reading tabs and headlines--terrific mobile platform. I have been enjoying the LA Times in digital format for years. The recent upgrade doesn’t work for me. Too many photos. Keep trying. What did you do? You took a wonderful newspaper app and you turned it into a stream of pictures with occasionally a story link between them. The Times app was perfect the way it was. Now it’s almost unusable! This subscriber to the electronic version only is no longer certain he’s going to continue because it’s atrocious. Change it back or I’m gone. LOVE the new format! State of the art design, graphics, and photographs along with incredible journalists! Wow! What an improvement!! Still a work in progress, still buggy, but potentially on its way to being the app a major metropolitan city deserves and needs from its newspaper. —No option to custom order sections is an egregious oversight that must be addressed asap. —When scrolling down through a section articles are repeated, over and over, hey LATimes if you're out of content let the user reach the end of the page instead of shoving the same article on us repeatedly as though we’re idiots and wouldn't notice. —Navigation is clumsy. —Not all articles had pub dates which is totally unacceptable. ——Photos are tough to access with buggy slide shows often freezing and making the app quit, don't even bother trying to access video. Emulating NY Times app could go a long way to improving the LA Times app. Looking forward to updates! Original review: It's staggering that paid subscribers are subjected to this miserable excuse for an app. Clearly the LATimes owner hates Los Angeles, hates Journalism, hates writers and hates even their own paid subscribers. It's tragic to see what was once a great newspaper degenerate into this app. Your site is fairly easy to navigate and the paper is always informative with News and other interesting articles. Offer old format as well! The new format is terrible. System continues to not accept the accurate login and password. Will have to delete app and reinstall next to see if it will work. The change in format is unnecessarily repetitive and causes the reader confusion and wastes time in quickly moving thru news - especially latest news - to find articles to quickly preview. Go back to old format. Pictures in quick feed unnecessary. Increase pix and artwork within articles -not Preliminary feed. New interface is slow and unwieldy. The old mobile app worked just fine. The new on line format is bloated and too expansive, wasting space and the reader’s time in scrolling to find the news. Really sorry to see this. Heading back to the NYT. Large pictures clog up the screen. Just copy the NYT or Washington Post. They are excellent for scanning thru articles and readability. Very disappointed by this new design. Each new “update” of this app keeps making it worse. The “latest news” section is gone and selecting articles to read has become a mishmash of fonts and other confusing graphical elements to navigate through. It has become so bad now that I’m considering canceling my subscription through the App Store even though it’s only $4.99 per month. The app developers should be ashamed. App is good but I cannot read enewspaper on app. It opens on Safari. Just got trial paid version and thought let's try the app... Can't even log in to my account. Kept saying invalid password, I even tried resetting it until I realized it's the app that's broken. I’m a subscriber of the full online newspaper, but I read this first thing in the morning ( after daily devotions). It a great source of news. Not too crazy about the”new version”, but it works. Thank you. I do not care for this new addition at all!! And where are the comics?? Get your subscription and read the LA Times on your phone. We need an LA newspaper and you need local news. All the LA Times subscribers who read their copy through this app have suffered for so long but I’m here to say No More! This is a much better than any of their previous versions. It makes sense, easy to read, no loud videos, no ads that take over the page. Good job LA Times app designers. Such a great improvement! Props to all of you. The app shows news stories from days ago on top. If you want breaking news getting an actual paper delivered to your home would provide more timely information. They’ve taken away the ability to remove sections, so one must scroll through their nutty lib bs to get to sports. Ugly bug on opening screen. Definitely not tested on an iPhone X. Not good. Fix the automatic loud ad videos! I keep getting startled and embarrassed during meetings when a loud video ad plays while I am scrolling through the news headlines. I write customer service and they said they have kicked it up to a higher level for troubleshooting. But alas no fix was included in the latest version. Have been a subscriber to the LATimes since moving to CA in the early 80s. I love the coverage and talent of the reporters and photographers. Thought I could go off paper to virtual with this app, but it has failed me on multiple levels. First off, there should be a way to search by date and reporters name for complete ease. If I go to find a story that might be a day old, and input the hard copy headline to share it online, more often than not, it will say no results, try the subhead, no results, try the writers name, no results. Very frustrated by this inability to find the story I want to share. Another pet peeve, I find stories I've read online in the print edition, show up days later in print making me shake my head wondering where I've read this before. I like the e-newspaper version, but it also is not without its glitches and the constant reloading of the page...probably a Cox Cable issue...but don't get me started on Cox. Do not want ads sounding off! This app was perfectly fine until they decided to have audio ads start up automatically. Wakes people up, interrupts others, distracting. Will give you one more update and then will delete if not fixed. Ok I am seriously going to give up. The app is organized so poorly that I never see most articles unless I know they exist and go digging. But the audible video ads? They literally make it impossible to use in most settings and make me stop reading and “run” to make them stop. I’ve been a subscriber of both the latimes and nytimes and while I use the nytimes app daily I’ve never downloaded the latimes app until today. From a visual perspective the design looks very “1990’s”. Good design is not expensive especially considering the resources of our local newspaper. It’s about having vision and valuing good innovative design. Content wise I appreciate the writing and editorial perspectives. I’ve been a subscriber to the LA Times for over 25 years. Sadly, the printed paper has slowly been declining in quality for the past 10 years - understandably given the difficulties the news business is facing. But the internet version of the paper is even worse - it is difficult to navigate, poorly organized and covered with advertisements. Hopefully, under new management things will improve - things can hardly get worse. Opening any article only gives me the code for it. Set aside the reporting for a minute and this app is very dated. There are ads galore and most of the stories in the default section are old. LA Times, compare this to something like the Washington Post app and you’ll see you have a long way to go. Help. It says no articles found. After I installed the update, this app stopped working. It says “no articles found.” Developed, please help me fix this problem. We are paid subscribers. Refund us! The header cuts off the time and status bar. Every section updates except Opinion. The opinion articles are all at least one week old. Are you not writing opinion pieces anymore? Doesn’t even display text properly. Displays a ton of raw html. Useless. I pay for the la times. The app never updates the stories. There are stories that sit on the app for a month. People consume the news electronically now. Get it together. Make a good app. I’m willing to pay to support the la times journalist, please update the app. Guys, I love my LA Times and am a long time subscriber, but please, for the love of God, take a glance at a functioning, well designed newspaper App like the NY Times, steal what works, and make my life less frustrating. Current version has very choppy scrolling and occasionally freezes and closes. IPad Air 2. Always relevant and well written, but the app often glitches, with headline links going to the wrong articles. This happens repeatedly with Charger stories for some reason. It’s also annoying having to restore my subscription over and over. NOT the way to reward a loyal reader. When I go to the LA Times app I’m interested in the news, but the app displays too many past features. Why not run the latest news? We’ve long appreciated the LA Times as one of our nation’s very finest. (One of the very best things about Los Angeles, about which we should all be proud!) We look forward every morning to the electronic daily edition, a wonderful convenience. We also still appreciate the tactile pleasure and the different but equal convenience of the paper edition, which we get each Thursday through Sunday. And we also look forward - immensely - to each issue of several electronic newsletter series that we’ve selected in conjunction with our subscription. Yes, we are LAT junkies. One of the best news sources, app is hot mess. I love the LA Times because of the high quality, well-vetted, and evenly reported news stories. However the app is literally a hot mess. Whenever I use the app, my phone heats up so much that it’s uncomfortable to use for more than 3 articles at a time. Also, my iPhone 7 battery drains at such an alarming rate while using the app. I can’t casually read on the go without worrying about power consumption and battery levels. This app leaves a lot to be desired. The LA Times should be capable of much better. Not worth paying for. Unfortunately, I DO pay for it. They fix one bug and ten more pop up. Recently, the LA Times app has started draining about 1% of battery per minute of use. It's staggering that paid subscribers are subjected to this miserable excuse for an app. Clearly the LATimes owner hates Los Angeles, hates Journalism, hates writers and hates even their own paid subscribers. It's tragic to see what was once a great newspaper degenerate into this app. what a pain to read! each apostrophe (you're, don't, can't) turns into code making nearly every sentence a mishmash of fluid text and garbage. why have an app no one can read properly? isn't printing what you are supposed to do flawlessly? why do you pay people to make an app that doesn't work? is this why you just raised the price of my subscription, so you can throw my money down the drain? jeez times. fix it. if you're selling it, it should be perfect. The west coast’s New York Times. This app looks like it was designed by a third grader. Actually there are probably third graders who could have done better. Shame because the articles are great. Too many ads; repetitive stories; clumsy interface. There must have been a background update recently that has made this app even worse. As of today, December 15, 2017, there are now long delays with the spinning gear while waiting for a selected article to open. Very frustrating and time/battery wasting. Often not responsive and too many ads even with paid monthly subscription. It also keeps forgetting I'm a subscriber and makes me re-enter my credentials. Videos connected with articles almost never play (although the associated ad videos seem to work just fine, which of course is just wonderful). I enjoy both versions esp the e-version that presents me the actual print. The enlarged fonts are a great feature of the app. Way to go L A !!!! App crashes on iOS 11.2. Tried deleting & reinstalling but it still crashes. You guys should be ashamed it should be provided free for emergencies like these. this is truly one of the nations best newspapers. The investigative reports article to any. I subscribe to the New York Times, the Washington Post, and the LA Times. A four day Home delivery subscription is remarkably inexpensive plus it gives you unlimited digital content. Society needs good newspapers. If you have an interest in the news, state and national, the Times Will satisfy you. I have a subscription to the LA Times. I think the app has god internal navigation and features for saving articles as well as sharing them externally. But some articles do not let me use the Reader option built into iOS. Also, I would like to find a way to filter for articles that are written by staff writers. Sometimes I don’t want to read an AP or TNS wire service article. Won’t let me login on mobile. If I try to reset my password it says I have to use Google. Only Twitter and Facebook are presented as options. I’ve had back-and-Forth’s with tech support and it’s like talking to really stubborn robots who are secretly trying to drive you crazy. LA Times is a good and important Newspaper. It provides real, independently reported news. Unfortunately the app is somewhat frustrating. It has improved, and I think it’s worth it for the solid content. I pay my monthly subscription and am continually blocked from the app saying I need to sign up for a free trial. There’s no way to sight in. This app is a waste of money. On two occasions I signed up to pay $5.99 per month for the LA Times app access. Despite numerous email communications with LA Times customer service as well as Apple support, They both were in capable of providing the service for which they advertised at $5.99 a month. Bottom line, I was refunded four months of service via Apple and was told to resubscribe at the amount of $7.99 per month. While I appreciate the refund, the bait and switch tactics that they employed will prevent me from subscribing again. I paid for a subscription via my iPhone ITunes account. The monthly fee was paid. Then suddenly I received a message that I’ve “reached my monthly article limit”. This is despite my credit card having been successfully billed and I was logged in with my ID on the LA Times app. There’s no way to correct it since I was signed in. I canceled my subscription and have to eat the loss. The resigned app is a joy to use and read, except in one area: eNewspaper navigation. It’s terrible. Rather than the text of the article scrolling, the entire article window tries to scroll and it “bounces.” Moreover, if there is an ad, you often can’t close it even if you click on the link to visit the advertised product or service. I vastly prefer reading the news on my iPhone and iPad to the physical paper or the website. I hope the developers straighten out these little friction points. My older review: I see articles in the paper that I want to read in the app and it sometimes takes a Herculean effort to find and get to them on the app (the website is basically the same in this regard). Please make it easier to find articles by organizing the information better and making navigation and search better. This paper continues to be, after 3 decades, a daily read for me. I live on the east coast and have never lived in CA. Always, informative, reliable, solid, entertaining writing! I see the same stories day after day. Not enough new news. Also, Hot Properties is buried under Business. What's up with that? So frustrating. 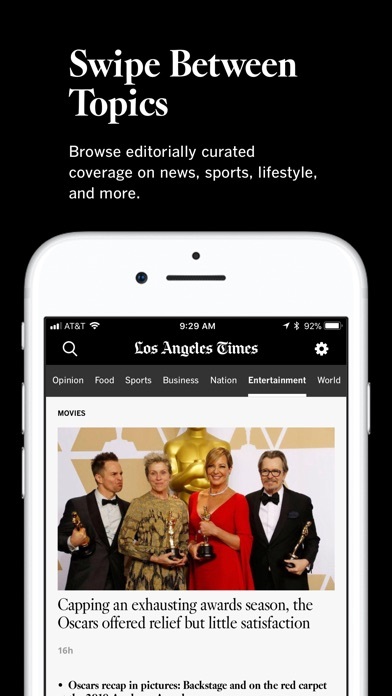 LA Times will not recognize you as having a paid subscription through this app. So when you click on a link, say on Facebook or Twitter, the app will not open to that article. You have to then log in and find that article. Also you get countless emails from LA Times asking you to subscribe to the paper no matter how many times you respond “unsubscribe” (because you are already subscribed through Apple). My suggestion is you subscribe through LA Times’ web site first then download the app. 1. When trying to move forward in the paper, it is too easy to hit the wrong arrow and be pushed back to them beginning. 2. Difficult to go to the next page when you expand the print. You need to resize the print. 3. Not user friendly to older folks who need reading glasses. Where can I get the app to like my paper subscription? Not easy. Yes, you need to subscribe to enjoy the Los Angeles Times’ content. But with so much fake news and dubious journalism online, this is essential reading for me. In the free LA Times version, when you click on an article, it should ask you if you want to proceed indicating the amount of articles you have left to read that month. I literally just downloaded the app, looking for a specific post from this morning, unaware of the 5 free articles a month, I clicked on 5 articles, no longer able to read any more. I kept seeing the number in the bottom increase but I simply thought it was an ad. I am very disappointed with this so called called app for local news. The LA Times is one of the worlds great newspapers. While I prefer to sit down with a cup of coffee and take my time reading the paper, when you’re pressed for time or away from home, there’s nothing better than to be able to pull up the Times on your cell phone or iPad and keep informed about what’s going on in the world. I often cannot locate articles on this app that appear in this days’ publication. Calendar has an article on Julian Schnabel by Emily Zemler, I’ve plugged in everything including the headline & it doesn’t show. You have “Entertainment” but not “Calendar” section. I’ve been frustrated many times trying to locate what seem to be obvious, current articles. Look at The NY Times, their format allows reader to see articles at a glance. The LA Time’s format means scrolling one article at a time. I want to support the LA times, but find I turn to the NYT because it’s online format is more intuitive and makes more sense and ease of viewing. Mostly about politics and all news is really bad, seems like the writers doing all fake news here. Trying to get account information is difficult. Problematic problems accessing on multiple devices and platforms even when I logon and enter ID and password. Password will work in one device phone, but not desktop. Need to keep up LA times my Slate and Bloomberg apps work flawlessly and they are free. Trying hard to keep you. I was hoping the app would improve but it did not over the course of the 2 years of my subscription. Articles are being repeated in same section over and over for days; the same stories dominate the different sections, ‘local’, ‘california’, etc. The mixing of different fonts is atrocious. It’s 2018 and it should be possible for a paper like the la times to have an app of ‘2018’. That’s it, I just canceled my subscription. You guys are no more than a leashed dog controlled by democraps. Hey all the illegal immigrant are criminals because they committed a crime when they crossed border illegally in the first place. Don’t try to tag illegals as good people. For months now I’ve had to log in on the web - app keeps refusing to recognize my log in information. Admittedly, customer service responded promptly suggesting I call but so far it’s been easier to find my articles online than mess with phoning. Never sent me a renewal notice, then they try to fleece me by charging me 10x more than I was previously paying. Customer service was rude and useless. Switching to the NYTimes and OCRegister. May not be the fastest, but the Times does its job and the reader can have confidence in what it reports with its professionalism. Definitely EASY, has ACCURATE reporting, and is a RELIABLE source. First of all, if you want to talk about neutral, how about we all remember that the LA Times was the only major newspaper that projected that Trump would win the 2016 election. Since then, they have not been afraid to call Trump on his lies, via their opinion section. But I go to the LA Times for coverage or pretty much everything, from national to local, financial, science and cultural news. I know their presentations will be factual and well written. I’m in online subscriber and I plan to keep it that way. Highly recommended! The app is terrible and the writing is biased. The Times was so good, but that was a long time ago. ...wish I didn’t have to see banner ads featuring dudes’ crotches in speedos. The LAT app works as most of the other apps in this space work. I haven’t had any of the issues some described. An enjoyable app.